GPUs and TPUs can radically reduce the time required to execute a single training step. Achieving peak performance requires an efficient input pipeline that delivers data for the next step before the current step has finished. The tf.data API helps to build flexible and efficient input pipelines. This document explains the tf.data API's features and best practices for building high performance TensorFlow input pipelines across a variety of models and accelerators. Illustrates that TensorFlow input pipelines are essentially an ETL process. Describes common performance optimizations in the context of the tf.data API. Discusses the performance implications of the order in which you apply transformations. 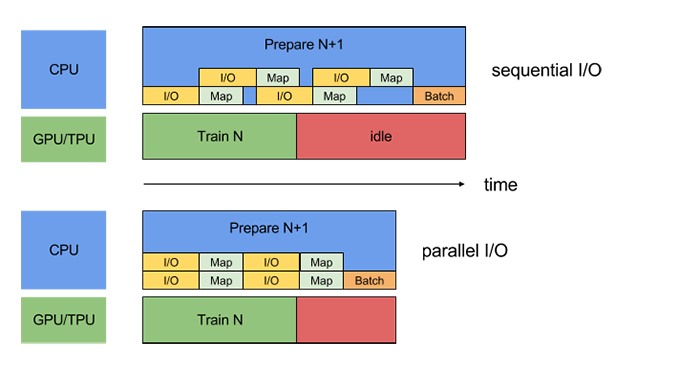 Summarizes the best practices for designing performant TensorFlow input pipelines. Extract: Read data from persistent storage -- either local (e.g. HDD or SSD) or remote (e.g. GCS or HDFS). Transform: Use CPU cores to parse and perform preprocessing operations on the data such as image decompression, data augmentation transformations (such as random crop, flips, and color distortions), shuffling, and batching. Load: Load the transformed data onto the accelerator device(s) (for example, GPU(s) or TPU(s)) that execute the machine learning model. This pattern effectively utilizes the CPU, while reserving the accelerator for the heavy lifting of training your model. In addition, viewing input pipelines as an ETL process provides structure that facilitates the application of performance optimizations. The next section builds on this input pipeline, adding performance optimizations. As new computing devices (such as GPUs and TPUs) make it possible to train neural networks at an increasingly fast rate, the CPU processing is prone to becoming the bottleneck. The tf.data API provides users with building blocks to design input pipelines that effectively utilize the CPU, optimizing each step of the ETL process. To perform a training step, you must first extract and transform the training data and then feed it to a model running on an accelerator. However, in a naive synchronous implementation, while the CPU is preparing the data, the accelerator is sitting idle. Conversely, while the accelerator is training the model, the CPU is sitting idle. The training step time is thus the sum of both CPU pre-processing time and the accelerator training time. Pipelining overlaps the preprocessing and model execution of a training step. While the accelerator is performing training step N, the CPU is preparing the data for step N+1. Doing so reduces the step time to the maximum (as opposed to the sum) of the training and the time it takes to extract and transform the data. The tf.data API provides a software pipelining mechanism through the tf.data.Dataset.prefetch transformation, which can be used to decouple the time data is produced from the time it is consumed. In particular, the transformation uses a background thread and an internal buffer to prefetch elements from the input dataset ahead of the time they are requested. Thus, to achieve the pipelining effect illustrated above, you can add prefetch(1) as the final transformation to your dataset pipeline (or prefetch(n) if a single training step consumes n elements). Note that the prefetch transformation will yield benefits any time there is an opportunity to overlap the work of a "producer" with the work of a "consumer." The preceding recommendation is simply the most common application. Choosing the best value for the num_parallel_calls argument depends on your hardware, characteristics of your training data (such as its size and shape), the cost of your map function, and what other processing is happening on the CPU at the same time; a simple heuristic is to use the number of available CPU cores. For instance, if the machine executing the example above had 4 cores, it would have been more efficient to set num_parallel_calls=4. On the other hand, setting num_parallel_calls to a value much greater than the number of available CPUs can lead to inefficient scheduling, resulting in a slowdown. Furthermore, if your batch size is in the hundreds or thousands, your pipeline will likely additionally benefit from parallelizing the batch creation. To this end, the tf.data API provides the tf.contrib.data.map_and_batch transformation, which effectively "fuses" the map and batch transformations. Time-to-first-byte: Reading the first byte of a file from remote storage can take orders of magnitude longer than from local storage. Read throughput: While remote storage typically offers large aggregate bandwidth, reading a single file might only be able to utilize a small fraction of this bandwidth. In addition, once the raw bytes are read into memory, it may also be necessary to deserialize or decrypt the data (e.g. protobuf), which adds additional overhead. This overhead is present irrespective of whether the data is stored locally or remotely, but can be worse in the remote case if data is not prefetched effectively. To mitigate the impact of the various data extraction overheads, the tf.data API offers the tf.contrib.data.parallel_interleave transformation. Use this transformation to parallelize the execution of and interleave the contents of other datasets (such as data file readers). The number of datasets to overlap can be specified by the cycle_length argument. The throughput of remote storage systems can vary over time due to load or network events. To account for this variance, the parallel_interleave transformation can optionally use prefetching. (See tf.contrib.data.parallel_interleave for details). By default, the parallel_interleave transformation provides a deterministic ordering of elements to aid reproducibility. As an alternative to prefetching (which may be ineffective in some cases), the parallel_interleave transformation also provides an option that can boost performance at the expense of ordering guarantees. In particular, if the sloppy argument is set to true, the transformation may depart from its otherwise deterministic ordering, by temporarily skipping over files whose elements are not available when the next element is requested. The tf.data API is designed around composable transformations to provide its users with flexibility. Although many of these transformations are commutative, the ordering of certain transformations has performance implications. Invoking the user-defined function passed into the map transformation has overhead related to scheduling and executing the user-defined function. Normally, this overhead is small compared to the amount of computation performed by the function. However, if map does little work, this overhead can dominate the total cost. In such cases, we recommend vectorizing the user-defined function (that is, have it operate over a batch of inputs at once) and apply the batch transformation before the map transformation. The tf.data.Dataset.cache transformation can cache a dataset, either in memory or on local storage. 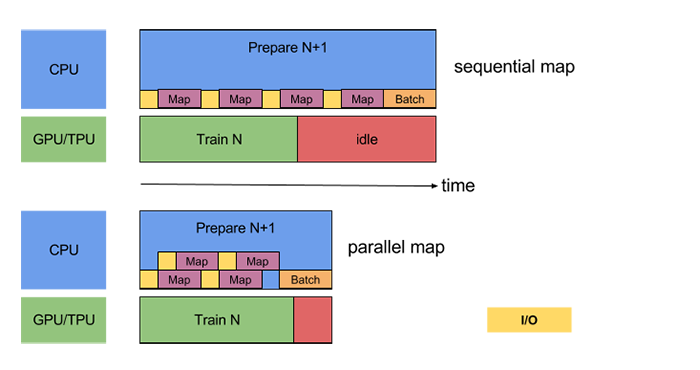 If the user-defined function passed into the map transformation is expensive, apply the cache transformation after the map transformation as long as the resulting dataset can still fit into memory or local storage. If the user-defined function increases the space required to store the dataset beyond the cache capacity, consider pre-processing your data before your training job to reduce resource usage. A number of transformations, including interleave, prefetch, and shuffle, maintain an internal buffer of elements. If the user-defined function passed into the map transformation changes the size of the elements, then the ordering of the map transformation and the transformations that buffer elements affects the memory usage. In general, we recommend choosing the order that results in lower memory footprint, unless different ordering is desirable for performance (for example, to enable fusing of the map and batch transformations). The tf.data.Dataset.repeat transformation repeats the input data a finite (or infinite) number of times; each repetition of the data is typically referred to as an epoch. The tf.data.Dataset.shuffle transformation randomizes the order of the dataset's examples. If the repeat transformation is applied before the shuffle transformation, then the epoch boundaries are blurred. That is, certain elements can be repeated before other elements appear even once. On the other hand, if the shuffle transformation is applied before the repeat transformation, then performance might slow down at the beginning of each epoch related to initialization of the internal state of the shuffle transformation. In other words, the former (repeat before shuffle) provides better performance, while the latter (shuffle before repeat) provides stronger ordering guarantees. When possible, we recommend using the fused tf.contrib.data.shuffle_and_repeat transformation, which combines the best of both worlds (good performance and strong ordering guarantees). Otherwise, we recommend shuffling before repeating. Use the prefetch transformation to overlap the work of a producer and consumer. In particular, we recommend adding prefetch(n) (where n is the number of elements / batches consumed by a training step) to the end of your input pipeline to overlap the transformations performed on the CPU with the training done on the accelerator. Parallelize the map transformation by setting the num_parallel_calls argument. We recommend using the number of available CPU cores for its value. If you are combining pre-processed elements into a batch using the batch transformation, we recommend using the fused map_and_batch transformation; especially if you are using large batch sizes. If you are working with data stored remotely and / or requiring deserialization, we recommend using the parallel_interleave transformation to overlap the reading (and deserialization) of data from different files. Vectorize cheap user-defined functions passed in to the map transformation to amortize the overhead associated with scheduling and executing the function. If your data can fit into memory, use the cache transformation to cache it in memory during the first epoch, so that subsequent epochs can avoid the overhead associated with reading, parsing, and transforming it. If your pre-processing increases the size of your data, we recommend applying the interleave, prefetch, and shuffle first (if possible) to reduce memory usage. We recommend applying the shuffle transformation before the repeat transformation, ideally using the fused shuffle_and_repeat transformation.